The Scriptures of the world seem to tell of two powers because they have been taken literally instead of interpreted in the light of spiritual inspiration. This has brought about a belief of separation between God and man, and this sense of duality is the root of all discord. 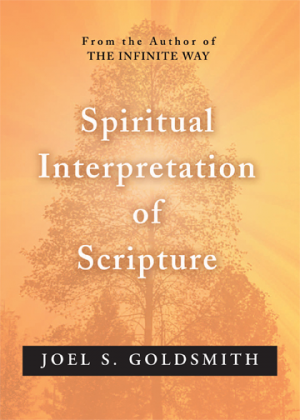 So says Joel Goldsmith in Spiritual Interpretation of Scripture. But, he says encouragingly, when we interpret Scripture spiritually, the deepest lessons of the Bible by which we may live are revealed to us. Foremost among these lessons is that God is the only reality of our being, and our conscious realization of our oneness with God will make the promises in Scripture real in our experience. Goldsmith intrigues the reader with the idea that the Bible is not a book outside of ourselves or a series of events that took place thousands of years ago. He says, “Scripture is the unfolding of characters and movements or happenings that are taking place within you – right this minute. Every biblical experience can be found in your consciousness at some time or other.” We embody within ourselves every Bible of the world, every philosophy, character and story, Goldsmith says, and when spiritually interpreted, these can be understood as states and stages of our spiritual development and unfoldment. Spiritual Interpretation of Scripture comes from Bible classes that Joel taught early in his ministry, and these classes were not recorded.